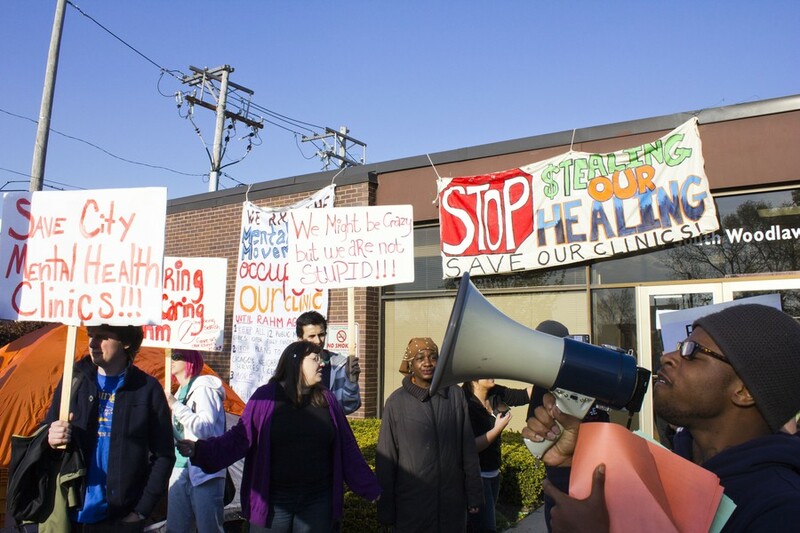 More than 100 activists assembled yesterday to occupy a Woodlawn mental health clinic scheduled for closure by the end of the month, and roughly two dozen patients and supporters who had holed themselves up inside the building were arrested. Around 4:30 p.m. yesterday, activists who had entered the building under the pretense of attending a farewell ceremony barred themselves inside the Woodlawn Mental Health Center on East 63rd Street and South Woodlawn Avenue with a month’s supply of food and water, while community members and students set up tents outside. The Chicago Police Department (CPD) arrived in force after protesters locked clinic doors with a chain and a bicycle lock. Officers attempted to enter several times through the building’s three entrances, but were blocked by a literal human wall. Eventually, they gained access, but remained impeded by makeshift barricades constructed from vending machines and chairs. At some time in the early morning hours, CPD officers broke through and began making arrests. Activists stationed outside were also rounded up, although they were not arrested and were merely forced to leave. The action initially was disguised as a celebration to honor the clinic’s 30 years of service and to lament its closure. Soon, however, organizers announced that they would be occupying the building until Mayor Rahm Emanuel met their demands. “We’ve tried every single official, legal channel. So yes, [occupation] is the last resort. We’re here, not because we want to break the law, but because the process for citizens’ public consensus is not working,” fourth-year protester Sophia Kortchmar said. Kortchmar, who is involved with organizing group Southside Together Organizing for Power (STOP), has been following the movement advocating against the closure of mental health clinics since last fall, when the city announced that it would close down six of its 12 public clinics to reduce costs. The proposed privatization of the clinics was projected to save the city $20 million annually, according to a memo released by the mayor in August. However, protestors say that the proposed clinic cuts will decrease the availability of care and increase patient loads to impossible levels, while privatized care would not be affordable enough. “When you live in a city, you believe that the function of that city is to take care of its people. Right now, the city of Chicago is on the trajectory of cutting vital services to its people,” Kortchmar said. Every clinic in the city was represented at the occupation. Patients and advocates spoke on the importance of the clinics during the celebration and occupation. Margaret Sullivan, a patient at Beverly Morgan Park Clinic on West 111th Street near South Racine Avenue, was one of the speakers. STOP and its affiliates have sent thousands of letters to Mayor Rahm Emanuel, reached out to most of the city’s 50 aldermen, held press conferences and rallies, and organized a 10-hour sit-in at City Hall, according to movement spokesperson and clinic patient N’Dana Carter. “This is the moment of culmination in the movement. There’s a lot of solidarity and a lot of people from across the city are here at the clinic. It’s a critical moment for us,” first-year and protester Emma Labounty said.